Paint swatches, who would have thought they would work to advantage on a card front? Hop over to Artful Inkables and check out their new stamp set with peacock feathers and paint swatches. I was digging around in my art supply closet and came across some unmounted stamps that truly did go to the bottom. It was a very happy find because this heart and the word stamps are from a very neat set of heart stamps from Invoke Arts . It's called Funky Hearts. I wasn't to sure about the paint swatches, but overall I really like the way this card turned out. 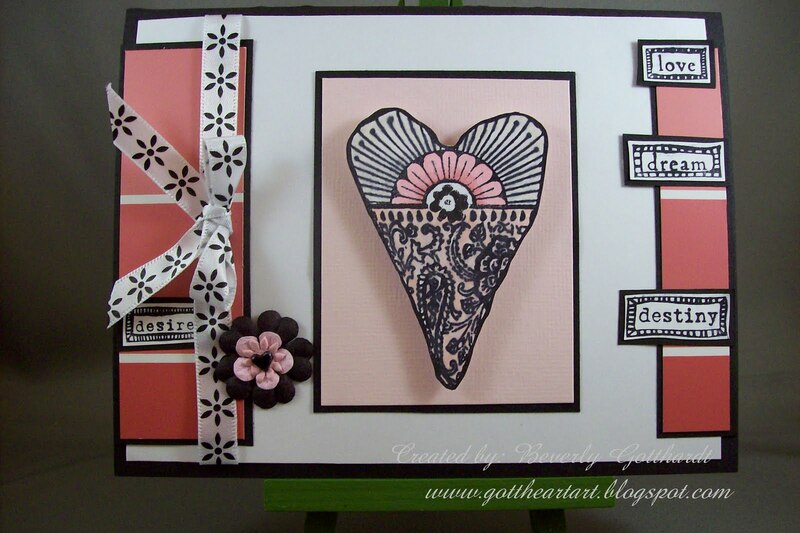 Supplies: Black Card Blank 5 1/2" X 6" Halcraft, Papers: from scrap stash, paint swatches, Stamp: Invoke Arts-Funky Hearts, Ink: Ranger Archival Ink-Jet Black, Copic Markers, Prima Flowers, ribbon-Michael's, pop dots. 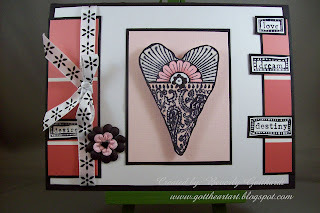 I really love this card Beverley... i'm getting used to pink with black,,, i quite like using them together. Yes i do love old horror movies.... Vincent price, boris karloff,peter cushing, christopher lee.... i cant stand blood and gore... i'm a total wimp! Your card did turn out awesome! What a wonderful find... your stamps were!I love when that happens! Thanks so much for playing along with us at Artful INKables! thank you for joining us at Artful INKables! love the paint swatches--can I CASE part of the card idea for some Mother's Day cards? This is really stunning!! LOVE it!